At The BIG I Conference last week we met with many of our new and existing Independent Agency Partners. 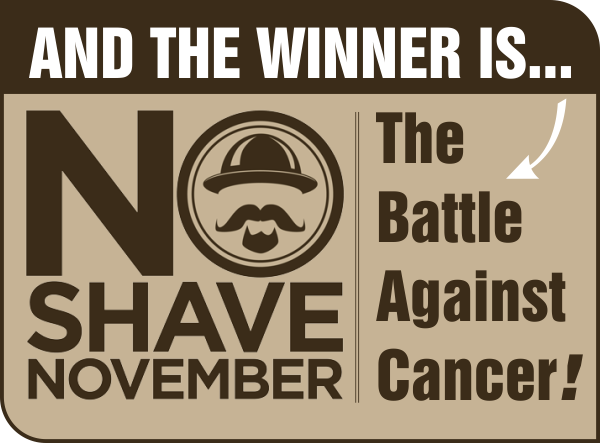 Our drawing was for a $100 donation, in the name of the winner, to Team Thompson’s No-Shave November Fund-raiser to benefit the Battle Against Cancer. As promised, the winner was drawn today, and the winner is Carmen MacArthur, Insurance Service Rep at the HAI Group in Cheshire, CT.
Congratulations, Carmen, and thanks to all of you who visited our booth expressing support for us and our efforts in championing this amazing cause. Visit our Team Page at: https://www.no-shave.org/team/TeamThompson - We’re at just over 50% of our goal of $1500 for the month. Your support would inspire us to the finish line. Thank you! We're reminding our P&C Partners (of which there are many) that we are here to help them grow their businesses and retention rates. We do this with customized automated marketing campaigns on behalf of our P&C Partners, offering additional coverages to your Personal Lines clients. Rounding your accounts can do wonders for retention and revenues. Life Insurance is the main thrust of these campaigns because that's what we do, but also because most Personal Lines clients don't know you offer it... and because Life Insurance represents less than 2% of revenues for Independent Agencies. So we help you tell your existing customers you can do it and how to go about it. Up-selling existing customers is the most efficient way to grow. They already know and trust you with their protection needs. We are leading the way in coaching Independent Agencies in developing alternative revenue streams by leveraging existing client relationships. If you're interested in boosting your retention, and bottom line let's get together and make a plan to make it happen. P.S. You wouldn't go to the store for apples if you have an orchard in your back yard. Looking for a differentiator in your BGA? Challenges for the individual Insurance Professional continue to mount as we move inexorably deeper into the digital age. How we communicate has changed, and what your customers expect has changed. Are you keeping up with it all? Do you stay in touch with existing clients on a regular basis? It stands to reason that if you want to retain existing clients you need to stay in touch with them to keep them from becoming prime targets for your competitors. Do you have a website? Your clients expect you to. Are you on Facebook? They are. That's why you should be. You have to go where they go. Do you collect email addresses of your client base? Your clients check their email everyday. Marketing Support is more than just a sideline for us. We do it full time for our new and producing partners. If you need a hand in securing and cementing relationships with existing clients, our Marketing Support Team is here to help, offering flyers, postcards, brochures, automated email campaigns, social media posts and website support. So, if your looking for Marketing Support and Communications Support to establish and maintain a superior level of service to your clients, to establish and maintain a higher retention rate then you are in the right place. You'll find it all here! We are in awe of the things you excel in and we are determined to support your efforts by offering the things we excel in: case analysis, carrier recommendations, creative problem-solving approaches, impaired risk guidance and state-of-the-art Marketing Support. Our mutually respectful and trusting relationships with the Home Office Underwriters who will ultimately evaluate your applicants, assures that your case will receive fair analysis and consideration. Sell more, and be more! 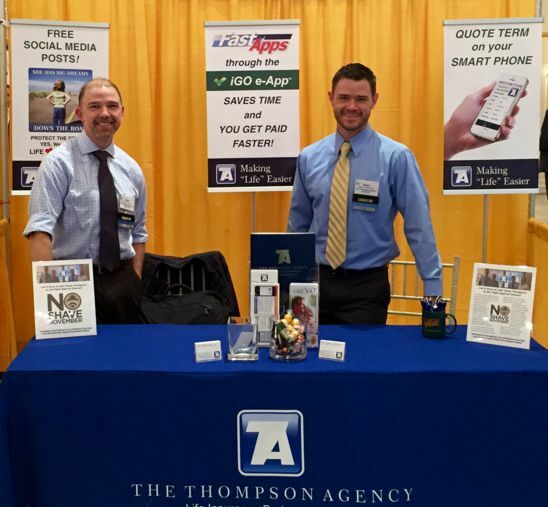 We invite you to join our ever-expanding team of successful Thompson Agency Partners, and enjoy the benefit of our thoughtful and creative case guidance and unrivaled Marketing Support. Multiple Sclerosis (MS) is an inflammatory autoimmune disorder of the brain and spinal cord, characterized by neurologic dysfunction caused by damage to myelin, the fatty substance surrounding nerve cells that normally facilitates nerve transmission. For this reason, MS is referred to as a demyelinating disorder. MS occurs about twice as frequently in women as men, and tends to be diagnosed between the ages of fifteen and fifty. The incidence and prevalence varies in different areas of the world, with the northern United States being one of the areas of high frequency. The exact cause of MS is unknown, although both environmental and genetic factors may play a role. Discrete episodes of neurologic dysfunction, called relapses, occur in MS. Although signs and symptoms can vary, some of the findings during relapses might include visual disturbances, including optic neuritis which is inflammation of the optic nerve, gait disturbance, spasms, numbness and tingling, fatigue, heat insensitivity, weakness, trouble speaking, tremor, vertigo, bladder and/ or bowel dysfunction, balance difficulty, pain, depression, and others. Major subtypes of MS are relapsing remitting, secondary progressive, primary progressive, and progressive relapsing MS. At diagnosis, most people have the relapsing remitting type of MS, which is characterized by discrete relapses with near or total remissions and no disease progression between relapses. Many with relapsing remitting MS will eventually enter the secondary progressive phase characterized by a progressive course and which may be associated with significant disability. The primary progressive type is characterized by progressive disease at the onset with a steady decline in function rather than discrete episodes of relapse. Progressive relapsing MS is associated with progressive disease at onset with acute relapses and disease progression between the relapses. The diagnosis of MS is based upon the demonstration of abnormal clinical or MRI findings in the brain and spinal cord that are “disseminated in space and time”. Dissemination in space implies that the abnormal areas found on MRI are located in at least two of the regions that typically are involved in MS. Dissemination in time signifies that clinical attacks occurred at different times or that the abnormal MRI areas appeared at different times. The presence of areas of demyelination on imaging does not necessarily prove that MS is definitely present. But MS is highly likely if there are MRI findings typical of MS and the clinical findings and the doctors’ impressions support this diagnosis. Other test results that might also add supporting evidence for the diagnosis of MS include the presence of antibodies called oligoclonal bands in the cerebrospinal fluid (the fluid that surrounds the brain and spinal cord), and abnormal evoked potentials, which measure the electrical response of the central nervous system to stimulation. Acute exacerbations of MS are usually treated with large doses of corticosteroids, sometimes given intravenously. A number of medications have been found to decrease the relapse rate, slow the progression of disability, and slow the accumulation of demyelinating lesions in relapsing remitting MS. Some of these disease modifying medications include the interferons, glatiramer acetate, and natalizumab. Natalizumab can cause serious and potentially fatal side effects and is not considered to be a first line agent. Certain characteristics may affect prognosis in MS. For example, the relapsing remitting type has a better prognosis than progressive types. Individuals who are younger at the time of onset tend to do better than those over age 40 at onset. The prognosis also tends to be more favorable if most of the symptoms are sensory, such as numbness and tingling. The underwriter considers a number of factors when evaluating applicants with MS, some of which include the subtype, number of attacks per year, stability of neurologic function, symptoms, complications, treatments prescribed, and evidence of disability. It is helpful if complete neurology records are provided. If recent information indicates little in the way of functional impairment and stable MRI findings, more favorable consideration may be possible. Applicant 1 is a 50 year old who had relapsing remitting multiple sclerosis diagnosed twelve years ago, had not had an episode in the past ten years, has no symptoms, a normal neurologic examination, and had a favorable follow up with the neurologist two months ago. This would be considered as “benign” multiple sclerosis. This case can be Standard Plus. Applicant 2 is a 35 year old who had relapsing remitting multiple sclerosis diagnosed five years ago, has had one episode per year, has been in remission for the past ten months, has a normal neurologic examination, and has no disability and no symptoms. This case can be Two Tables. Applicant 3 is a 30 year old who had progressive relapsing multiple sclerosis diagnosed two years ago, is wheelchair bound, taking natalizumab, and who was recently hospitalized with an exacerbation and received intravenous corticosteroids. This case is a decline.